IoT tutorial provides basic and advanced concepts of IoT. Our Internet of Things tutorial is designed for beginners and professionals. 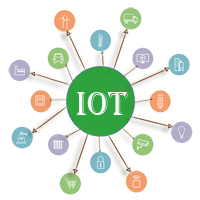 IoT stands for Internet of Things, which means accessing and controlling daily usable equipments and devices using Internet. Our IoT tutorial includes all topics of IoT such as introduction, features, advantage and disadvantage, ecosystem, decision framework, architecture and domains, biometric, security camera and door unlock system, devices, etc. Our IoT tutorial is designed for beginners and professionals both. It contains basic and advance concept including live projects. We assure that you will not find any problem in this IoT Tutorial. But if there is any mistake, please post the problem in contact form.